Have you solar panels stopped working? Are consumers being ripped off by the top 6 energy firms? Energy companies have been taking advantage of consumers since the utilities were privatised and you don’t need an inquiry to tell you this market is dysfunctional, you just have to look at it. Six big players have a 95% market share and they seem to operate like a cartel, the prices go up in conjunction. What can you do to fight back? •	Change Energy provider. Avoid the top 6 – there’s some great deals out there. •	Install PV solar panels. Part of your energy bill goes towards Green taxes – so reap the benefits. Currently (1st November 2013 for under a 4kW system), the Energy Providers are paying 14.90p for every unit of electricity generated – even if you use it all yourself!! There’s nothing sweeter than receiving a cheque from one of the top 6!! •	Scottish Power on 25/10/2013 paid me, £1,160.23 for this summer’s generation. I have a 4kW system, South facing in Sevenoaks Kent. •	With the development of pv solar battery packs, it won’t be long before I can store my excess energy and not sell it back to the grid for a 4.5p per unit but use it every evening or during a power cut. •	The question is not should I have PV solar panels but why haven’t I already!! The Rapid growth of the Solar PV industry in 2010/2011 meant that many companies were started up by people who looked on it as a Get Rich Quick scheme. Installations were done by barely trained staff ,and the emphasis was on getting the job done before the deadline of the Feed in Tariff reduction. Many of these companies have now gone out of business leaving a legacy of shoddy installations on leaking roofs. From the very start , at PV Solar Installers Ltd , we were determined to do things differently. I have nearly thirty years experience as a roofing contractor, and I made sure that on all our PV installations, we strengthened the roofs,doubling up the rafters wherever there was a fixing bracket. We also ensured that all brackets were weathered by an appropriate lead flashing where the roof covering required it. If I make a hole in a roof, I make certain that it is weather tight afterwards. On a number of projects I re roofed the roof slope under the panels as I was unable to certify that the existing covering would last as long as the panels on top. We have now decided to offer our experience and skills to those who are experiencing problems with their roof top Solar PV system,or leaks in the roof covering underneath the panels. We are happy to advise on and carry out appropriate remedial work where necessary. 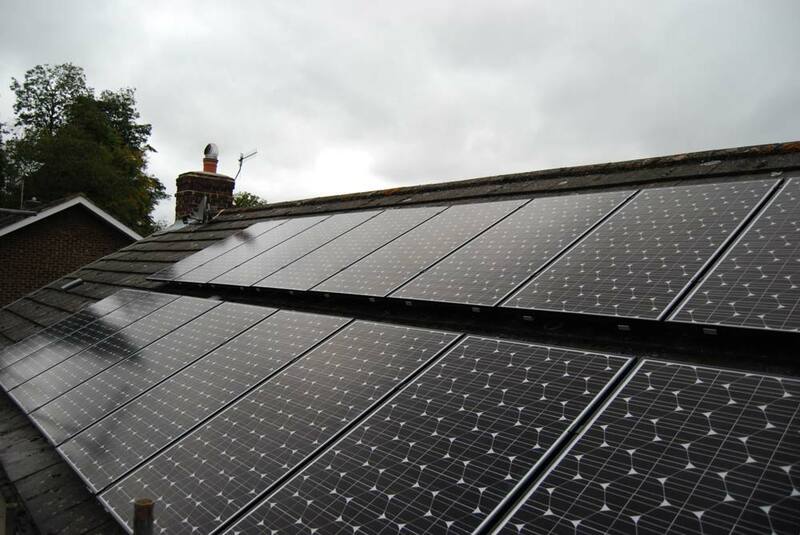 In November 2011 we installed a 2.3kW pv solar installation at Mr. Evans from Chelmsford, Essex. Using the government figures we predicted that Mr. Evans would make an annual income/saving of £1000.77. One year on, his tariff payments = £1066 and his electricity bill has been reduced by £20 per month giving an annual saving of £240. Actual total income/savings = £1,306. 30% more than predicted, not bad!!! Needless to say Mr. Evans is delighted. Are pigeons or other birds, rats or mice nesting under your solar panels? PVSI is being called on more and more to pest control solar panel Installations. We offer this as part of our service,on either existing or new installations.We’re very reasonable call us for a quotation. Pest proof your solar panels now with PVSI. PVSI are getting involved with solar schools, to help schools get solar panels. We’re happy to install panels for free on schools!! Call for Juliet for more information. Important updateIn January 2012, the UK Government appeal against a High Court decision ruling that the Solar FITs Fast Track review was unlawful was unsuccessful. However, this is not the end of the matter: the UK Government are currently seeking permission to appeal the decision to the Supreme Court. In light of this they cannot rule out the possibility that lower tariffs (21p) could be applied to installations which became eligible for FITs on or after the proposed reference date of 12th December 2011. As such there is still uncertainty over which tariffs householders will get if they install between 12th December 2011 and 3rd March 2012. The UK Government response to the consultation on FITs for solar PV. Outlining a new energy efficiency requirement for FITs. From 1st April householders wishing to receive FITs will need to show that their property has an EPC band D or higher. A consultation on solar PV cost controls. This sets out the UK Government’s proposals for six monthly degressions for solar PV tariffs, to ensure the UK Government’s “commitment to a stable, predictable future for solar PV and for the whole FITs scheme”. The consultation closes on 3rd April. A key consequence is that from 1st July 2012 the FIT tariffs for solar PV are likely to drop again. A consultation on tariffs for FIT technologies other than PV. This sets out the revised FIT rates for technologies other than PV. The consultation closes on 26th April. Regardless of what some installers may say there is no guarantee that householders will get the higher (43.3p/kWh) rate for installations with an eligibility date between 12th December 2011 and 3rd March 2012. Customers who install on the assumption of the higher rate do so at their own risk. The actual tariff applied to installations with an eligibility date between 12th December 2011 and 3rd March 2012 won’t be confirmed until the legal process has been completed. The Government has 28 days from the judgment to lodge an appeal with the Supreme Court. Householders should plan on the basis that at the very least they will get 21p/kWh. Householders with an eligibility date after 3rd March 2012 will receive 21p/kWh. Householders with an eligibility date after 1st April 2012 will receive 21p/kWh provided that their home has an Energy Performance Certificate (EPC) Band D or better (A being the best). Homes which do not have an EPC Band D or better will get will get a reduced generation tariff rate of 9p/kWh. For householders with an eligibility date after 1st July 2012 it is proposed that the rate should between 16.5p/kWh – 13.6p/kWh. The exact rate will depend upon the amount of solar PV installed between March and April 2012. Note: The eligibility date is usually the date that your FIT supplier (also known as the FIT licensee) receives a valid application for FITs, which is likely to be after the date your solar PV system has been installed. For more on this subject, see What is the definition of the eligibility date? On Saturday 7th May 2011, PV Solar Installers Ltd. hosted a local “Solar Party”. This was an event hosted at the CEO of PVSI’s own home for the local members of the community to come and check out the house’s 4.0kW Sanyo PV System. The event lasted for three hours and during this time local residents were presented with the full installation and were invited to ask questions about issues like climate change and how Solar Panels help to reduce their carbon footprint. At the same time, they were informed by the PVSI team about the financial savings and rewards of having a PV Solar system, the Government’s Feed-in Tariff and the process they would follow if they wanted to have a PV Solar System installed on their properties’. The event was a terrific success and a large amount of support was shown by the community. As a result, a great deal of interest was sparked with many people asking for quotes for an installation on their homes. The team at PV Solar Installers Ltd would therefore all like to offer their thanks to the community of Plaxtol. Two on roof systems installed in Brighton and East Sussex. 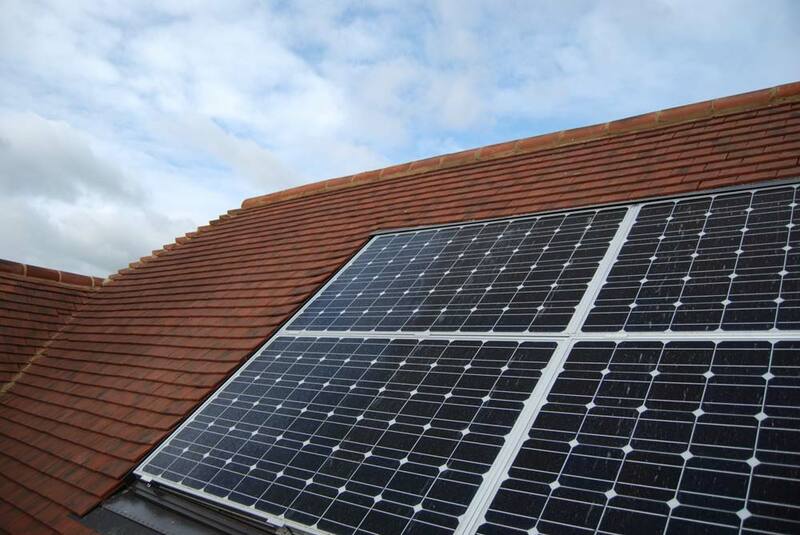 We install a 4kw Sharp Panel Array using a Shuco in – roof mounting system. As part of a roofing renewal carried out by Channon Roofing, the mounting system was fixed onto the new tile battens and the Panels were then attached and wired in. As the roofing works progressed, the system was weather proofed with the proprietary flashing kit and tiled into place. This means that the entire array sits flush with the tiles and is fully waterproof. Certainly no time to update the website as so busy! We have installed a large number of on roof systems in Kent, Essex and London. In all these installations we made a point of strengthening the roof structure and ensuring each penetration to the roof, for fixing brackets, was weather tight. With large interlocking tiles, this was achieved by using an angle grinder to cut a groove on the underside of the tile to ensure that once the bracket is fitted, the tile can be replaced and sit snugly. On plain tile roofs, we ensured that each bracket was weathered with an individual lead flashing. The roof was then retiled around using additional Gable tiles as necessary to ensure that there were no gaps and to maintain the tile bond. There was no specific guidance on this, so I drew on my roofing background to ensure a weather tight installation system. Field Mounted System .Plaxtol near Sevenoaks. This involved locating a system in the grounds of a Manor House in Plaxtol. A mini Digger with a 200mm diameter Auger drill attachment was required. We drilled 2 m deep holes in the ground to accept the Field mounting posts which were then concreted into place. The 4kw Panel array was then attached and an external inverter bolted on. The cabling was then run to the house along a boundary fence on a proprietary post and trunking trays. The whole project from planning application ,installation and final certification was carried out in house. Get a Quote. Get in touch with us today via our online form for a free quote. Get in touch by phone. © Copyright 2011 PV Solar Installers Ltd. All rights reserved.